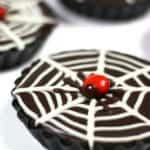 These tarts are just the right mixture of spooky, innocent and elegant. Perfect for a Halloween party! Line a baking sheet with wax paper. Pipe stars with 8 points. Place a large M&M in the center for the spider body. Pipe a small amount of chocolate on the tip of one of the spiders. Add a mini M&M to the drop of chocolate to create the spider head. Chill. In a food processor, add cookies. Pulse until cookies are completely crumbled. Transfer to a large mixing bowl. Top with melted butter. Press the crust mixture into tart pans. Use the back of a spoon to smooth the crust cavities and press firmly into the tart pan crevices. Add chocolate chips to a large mixing bowl. Set aside. In a saucepan over medium high heat, stir together butter, cream, Dixie Crystals sugar and salt. Bring to a boil and remove from heat. Pour cream mixture over chocolate and stir until chocolate is completely melted. Distribute ganache into tart pans. Let cool slightly. Fill a piping bag with melted white chocolate. Starting in the center of a tart, pipe a swirl design around the ganache, moving from the center to the outer edge. Use a toothpick to draw lines from the center to the outer edge to make a web design. Pipe over the lines if desired. Add a spider over top of the tart for decoration. Refrigerate 3-4 hours before serving.